Behind the Scenes Progress Update! While SHED looks much the same as it did in our last video update (watch it HERE) we have made some very important progress and the space around SHED is quickly filling up with materials. In the last few weeks we have been gearing up for the next stages of construction by purchasing and transporting goods out to the site. We officially have acquired all of our wall and roof sheathing (20 sheets of 3/8” & 6 sheets of ½” plywood respectively) as well as the 20 sheets of 1” thick rigid foam board insulation and 20 tubes of Locktite foam formula glue that we will use to glue our foam sheets to the plywood sheets to make our continuously insulated panel. We have purchased a cute little 32” x 32” 1 peace shower unit and are working on ordering a custom pivot glass shower door for it. Our beautiful windows are still sitting in secure storage all wrapped up and waiting for their turn in the construction process as well as our reclaimed corrugated metal siding. We picked up our “traffic master allure resilient flooring” which we went with for a few different reasons including it lack of depth and weight, floating installation, nearly waterproof result and because a friend just install it in his house with great results. We have picked out our (3) doors (main door with full light and internal blinds, secure metal door to gear storage room and an interior pocket door slab with full frosted light for our bathroom door) and are just waiting for another “closed quote promo” to receive 15% off of our purchase upon ordering. 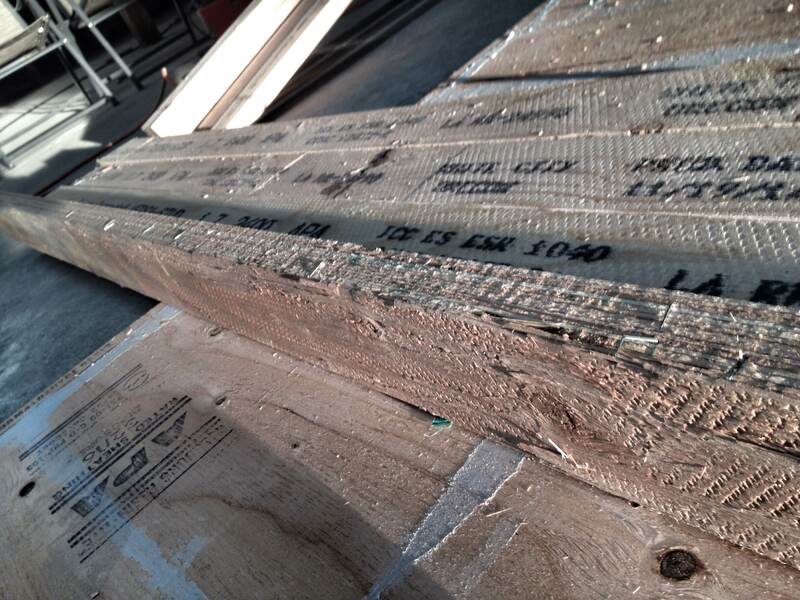 Lastly, we have purchased (8) 1.5” x 3.5” Laminated veneer lumber “beams” for our exposed loft structure. 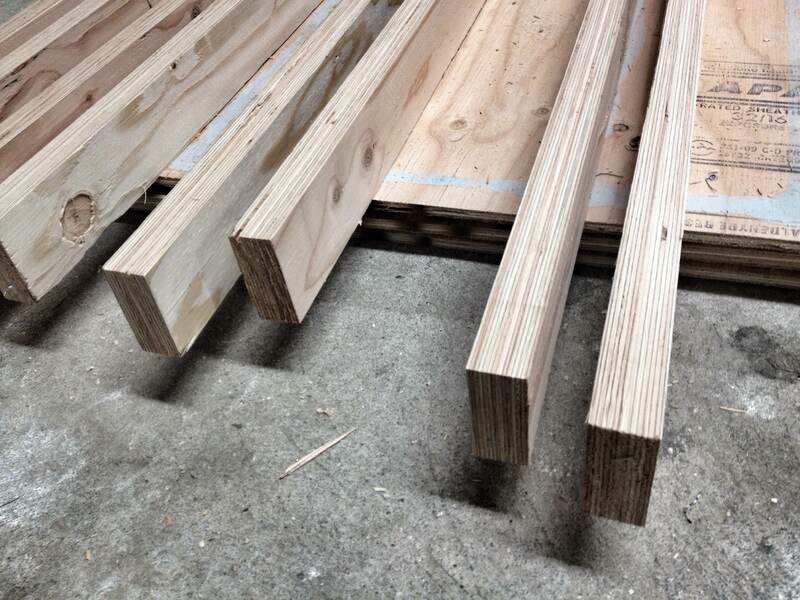 Hardware: We have been busy carefully bolting, strapping and bracketing the crap out of SHED to ensure that the roof stays connected to the walls, which stay connected to the floor and trailer. We have done this with a variety of hardware starting with small “L” brackets that connect the studs to the bottom plate and hurricane straps that connect the rafters down to the walls. We then used (4) HTT5 Simpson Strong Tie tension connectors ($28.00 each!) to connect the 4 corners to and through the trailer flange using 5/8” bolts. In 6 more spots we used heavy duty 12” tall “L” brackets to also secure the wall to and through the trailer flange using 5/8” bolts in the same manner as with the Simpson Strong Ties. I would love to see a large x-ray image of SHED with all of its new shiny metal hardware installed. 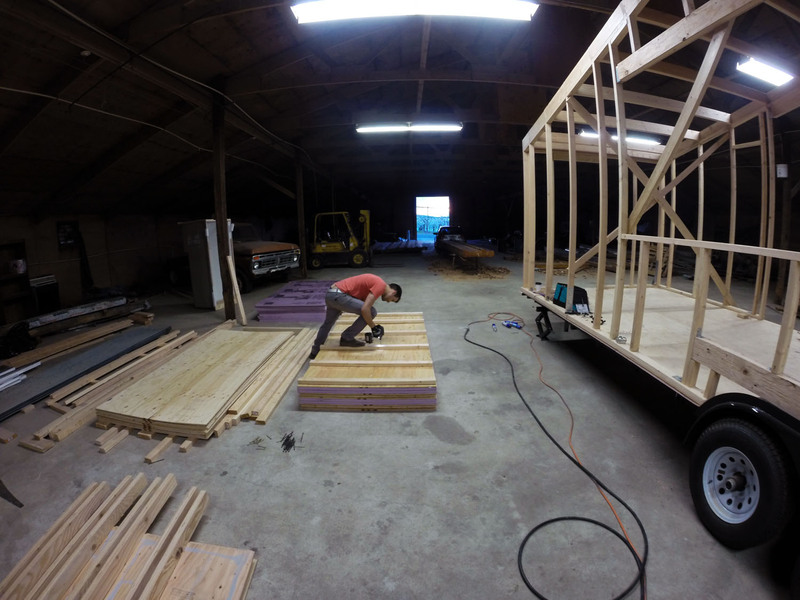 A firm shaking of the trailer already has us pleased with how well it is stiffening up and we have yet to add the most important component of our wall system: plywood. Give visual relief to the long flush elevation by providing a micro inset in which we can employ a different material to break up any potential monotony. Provides a touch of cover for the front door seams when it rains. Rather than entering along a wall you will be entering into a space. It is an extremely minor change but the angle of entry for the visitor towards and into the space will help maximize the feeling of spaciousness as the ceiling extends upward and away and the two largest windows are directly in front of you. The use of an out swing door means wind pressure is trying to push the door closed rather than open, increasing the seal of the door during transportation when pressure driven moisture penetration is most likely. To this affect we have taken out a few studs and increased the size of the new header over the larger opening in preparation for our new design. After much indecision, detailing, and frustration with our inability to get professionally laminated C.I.panels in the size and quantity we needed we decided to do it ourselves. We combed through some rather elaborate schemes as to how we could achieve this including sourcing very expensive glues and taking a few weeks to build a couple hundred dollar large vacuum laminating contraption to use atmospheric pressure to our advantage. We also considered stacking the layers of foam glue and plywood together and using a fork lift to stack heavy weight on top of it, but were uncertain of how even the pressure would be and didn’t want to risk crushing the foam. Finally, we settled on another time consuming method that only required some extra 2x3s and long screws that we had laying around. You can see the process in the time-lapse video but it goes like this: evenly distributed 2×3’s -> plywood -> glue -> foam -> foam -> glue -> plywood -> 2x3s matching the location of those before -> screws all the way through the entire sandwich from the top 2×3 to the bottom 2×3 to pull them together and displace that pressure to the glued assembly for 24-48 hours before removing all of the screws and 2x3s. This produces 2 panels at a time but can be stacked and repeated more than once at a time as we have done in the video below which shows 6 panels being laminated at once. 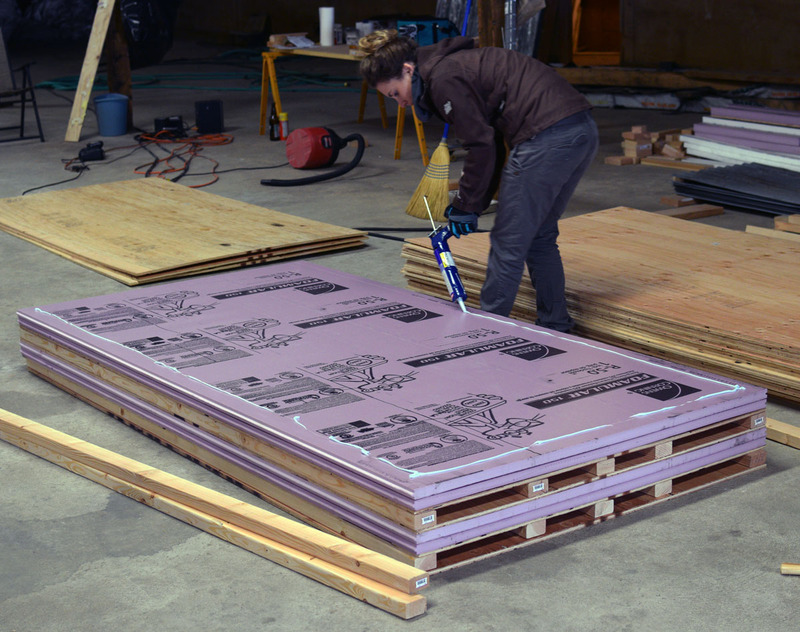 So far we have completed half of our panels (10) and this process appears to work well as we cannot pull apart the layers and the panels are stronger than either of the two materials on their own. While I wouldn’t consider this truly lamination, it is a pretty affective way to strongly adhere the two materials. 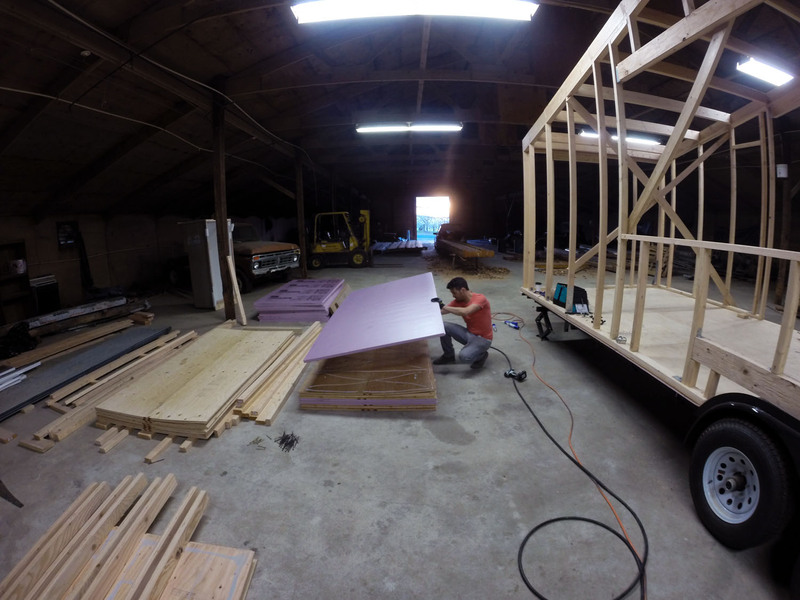 Our goal for this last weekend before our trip to the Sierra Nevada is to get all of our panels laminated and our loft structure installed. 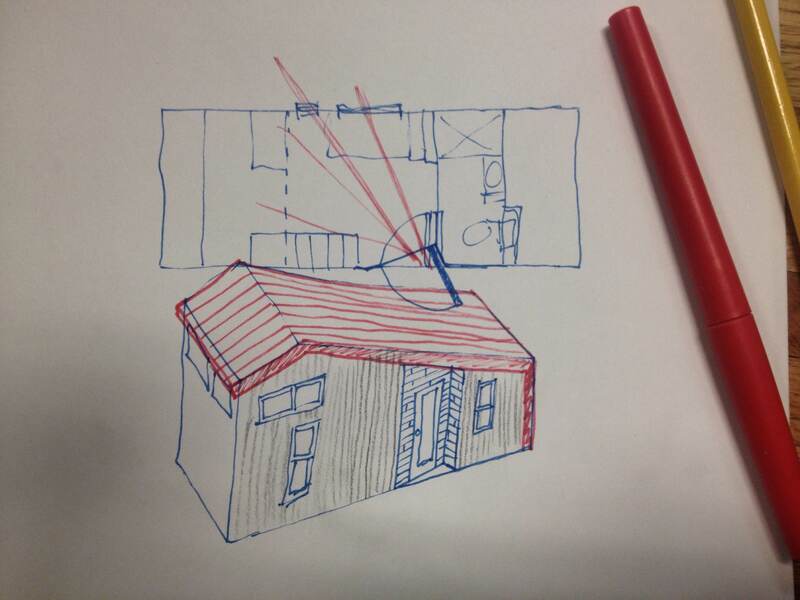 Two loft details have been up in the air since the beginning of this project: What material we want to use for the beams and how we were going to connect them to the vertical wall structure. We are glad to report that we have committed to answers on both of those quandaries, albeit with some time consuming detailing and processing of course… Because the loft beams were going to be exposed on the underside of the kitchen we wanted to use a material that was both clean and unique and decided on laminated veneer lumber beams. LVLs are stronger and straighter than normal lumber, we like the edge condition aesthetic of the veneer striations and we naively assumed that the ability to use small pieces of veneer in their manufactureing would make for a clean aesthetic void of knots and major flaws. Now I am sure with a little more research and knowledge we would find that you can maybe specify “architectural select” LVL for exposed applications but having never ordered or personally worked with LVL beams and at $2.11 a linear foot these 8 beams were already very expensive and we assumed the quality would match. As you may have guessed based on my prelude, I was sorely disappointed when I picked up the custom ordered beams. The broad face was inked up with Boise cascade indentifying notations, chock full of knots & veneer seams and obnoxiously full of staples used to hold on the thin un-protective tyvec wrap over the small bundle. The edge condition wasn’t any better and the corners were pealing, chipped and dented. In fact, they looked much worse than a standard 2×4 which I could have purchased 8 of for the price of ONE of these beams. I internally caulked it up to a mistake in my decision making that cost us some money and went on my way knowing there was work to be done to try and salvage our original idea for these beams. We barrowed a planer from a friend who owns ATLAS & CEDAR, an incredible custom furniture business here in Yakima, WA and took it out to the build site determined to clean up the appearance of the LVL beams. After trying to determine the nicest edge and side of each beam I did 1 pass on both the “bad” side and “bad” edge and 2 passes on each of the “better” sides and edges for a total of 6 passes through the planer for each board. The result as you can see in the photos is certainly better but not perfect and there is still some work to do on the edges with sand paper. At $168.00 though, there is NO way we are not using these beams. We have finally detailed the connection of the horizontal loft beams to the vertical wall structure as shown above. 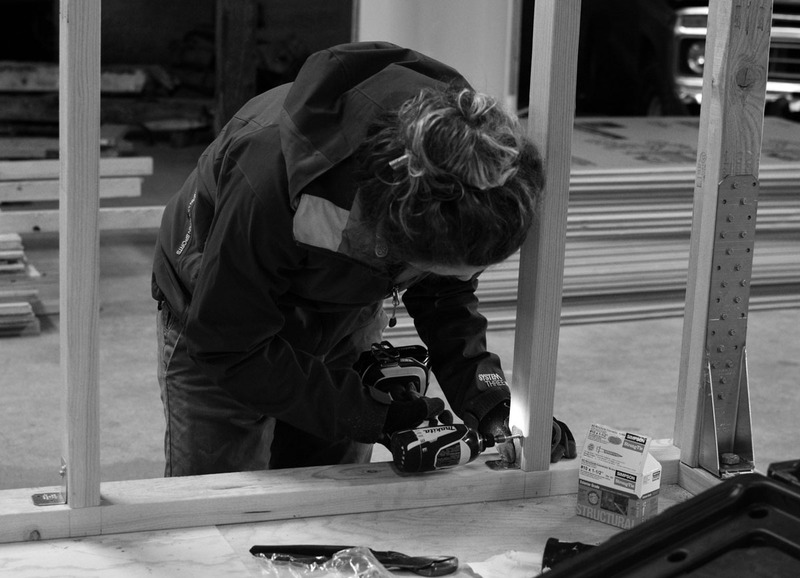 While it is not hard to figure out how to hold the loft beams up, we are trying to devise a way to detail the connection so that it helps resist lateral forces. 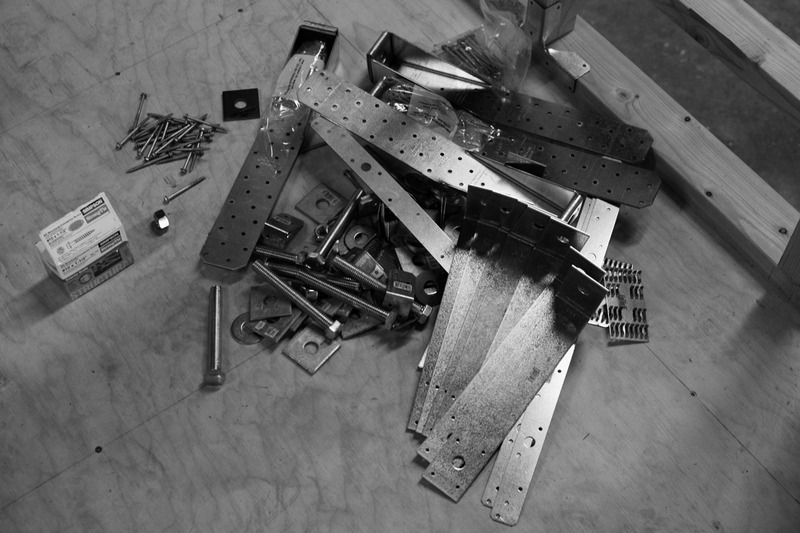 We have done this by using two beams, one on each side of the stud combined with a “T-bracket” that takes what usually acts as a hinge joint and distributes the fasteners and forces vertically and horizontally along the members, away from the pivot point, creating a more rigid connection. You chose the LVLs because they are stronger and straighter than normal lumber. Is there also a weight consideration over normal lumber? I have never worked with them. Was the Zip R-sheathing not available or the wrong size? We didn’t look into zip sheathing.